The first known Batmobile to be licensed by DC Comics has sold at auction this weekend for $137,000. This car is custom 1956 Oldsmobile 88, and it was made before TV series Batmobile. This Batmobile was the creation of 23-year-old Batman fan Forrest Robinson, who along with a friend, spent three years customizing a 1956 Oldsmobile 88 with a 324 Rocket engine to resemble the single-fin vehicle in DC’s Batman Comics from the 1940s and 1950s. Robinson’s Batmobile was completed two years before George Barris began customizing a car to become the Batmobile for the 1960s ABC TV series about Batman. 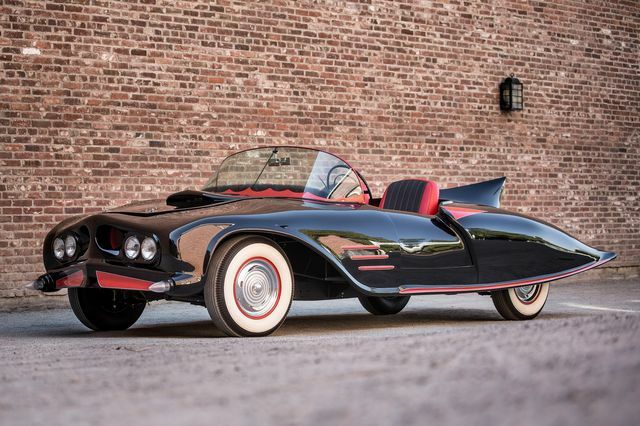 The Barris Batmobile sold at auction in January 2013 for $4.2 million. In 1963 Forest Robinson completed what was to be the first road-going car officialy licnsed by DC Comics as a “Batmobile”, which is more recongnizable as an interpretation of Batman’s car in the early comic books, than from later television and film incarnations. The television show’s popularity made Robinson’s Batmobile such a sensation that a DC Comic Book licensee leased the car from Robinson and rebranded it Batman’s Batmobile for touring, primarily in the eastern United States. Eventually, replicas were made of the TV Batmobile and Robinson’s car was returned and Robinson reportedly sold the car a few years later for $200. It has since been meticulously restored and was put up for sale again, this time by Heritage Auctions in Dallas. But this time the car to fetched a little more than $200 — the opening bid was set at $90,000 but the final bid came in nearly $50,000 over that price. "Transformers: Age of Extinction" (2014): What for Michael Bay started shooting his film? The Aston Martin DB10 will be James Bond's New Car In "Spectre"